I was looking for scenic views, but came up with a "how to photograph fences" in an interesting way theme. Have you ever set out to photograph a certain subject and come away with nothing? That's what happened to me. 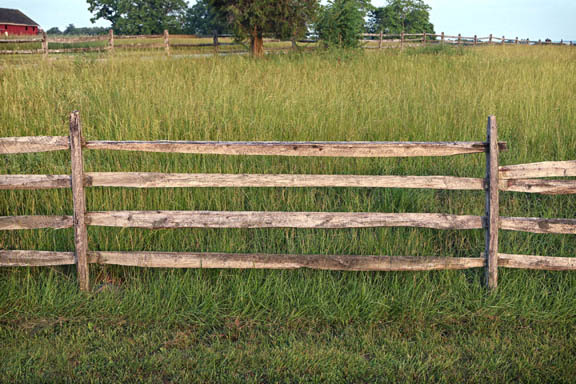 I liked the diagonals in this photo of the battlefield fences. A funny thing happened during a recent photo shoot at Gettysburg battlefield in Pennsylvania. My original intent was to photograph the interesting scenes at this historical landmark, preserving a slice of our country's history. I purposely go on photo excursions several times each year, just to get away from business, take photographs just for fun, and share my thoughts and some of the images on this digital photography blog. During this particular trip I had other obligations so my opportunities for photography were a bit limited. 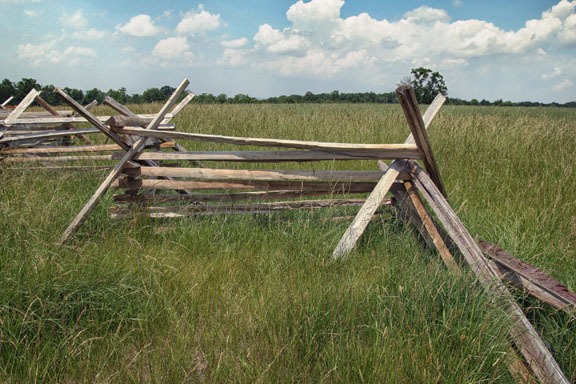 This first photograph of this battlefield fence, taken on my first day visiting the Gettysburg National Military Park, wasn't one of my favorites, but I included it in this blog to make a point about composition. I liked the diagonals contrasting with the parallel lines and tried to capture the fence in an interesting way. Looking back I wish stood on top of my van so that the top of the fence would not be at the same level as the horizon. The clouds were nice, the fence had some interesting textures, and I liked the angles. I used the rule of thirds to place the horizon and I used a diagonal line at the bottom right corner to lead the viewer into the photograph. The lighting during the middle of the day is sometimes disappointing and often not my favorite time for photography. I returned to the battlefield before sunrise the next morning to take advantage of what I call "sweet light." This photos was all about textures brought out by the soft morning light. I liked the soft morning light, the textures, and the symmetry of this fence, with the fallen top rail on the far right and the red barn on the left, breaking up the symmetry just enough. Remember I am definitely a camera geek and I get a kick out of certain visuals that present themselves to me. I've always been intrigued by repetition in photographs ever since I was a young photographer. The freshly painted white fence really jumped out at me, and I got this, my favorite fence image, early that second morning. 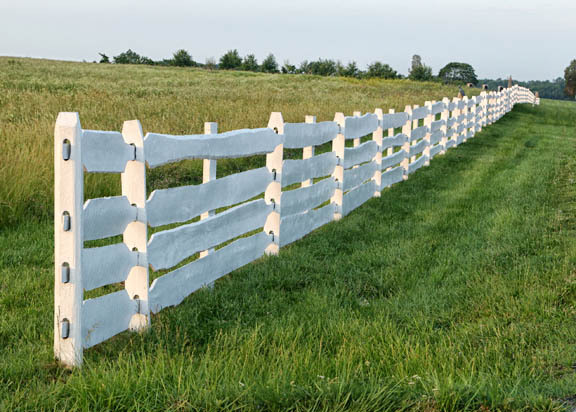 Two rules of composition that often work well with photographing fences are diagonal lines and the rule of thirds. Please consider sharing this photo. Keep it simple. Look for uncluttered backgrounds so that your attention is kept on the interesting aspects of the fence. Time it right. You get dramatic differences in what characteristics come forth based on the time of day, direction and quality of the lighting. Make a conscious effort to pay attention to lines, balance, and perspective. The Gettysburg battlefield is a beautiful area of rolling hills with significant historical importance but nothing struck me as an interesting photography subject except the fences and the cannons. I certainly wasn't looking to post about how to photograph fences but sometimes it's okay to just go out and shoot whatever interests you when you get to your destination. Watch less TV. Shoot more photos. You can find the photographs of the cannons shot with my Canon 70 D on the Canon camera geek blog; www.CanonCameraGeek.com.